This past May was fairly warm across most of the United States, including here in New York City. The average temperature for the Earth as a whole, however, soared into the record books. 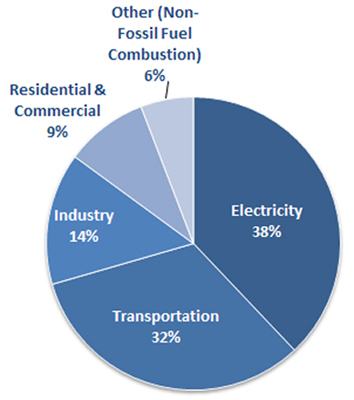 According to a report released on Monday by NOAA’s National Climatic Data Center, May 2014 was the warmest May ever recorded for the entire planet. 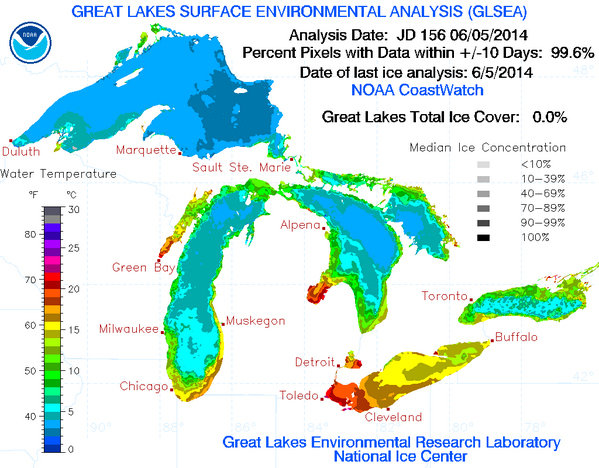 Earth’s combined average temperature for the month – over both land and sea surfaces – was 59.93°F. That is 1.33°F above the 20th century average. May 2014 also marked the 351st consecutive month that our global temperature was above its long-term norm. The report also noted that four of the five warmest Mays on record have occurred in the past five years: 2010 (second warmest), 2012 (third warmest), 2013 (fifth warmest), and 2014 (warmest); 1998 holds fourth place. Additionally, it highlighted the fact that this past meteorological spring (March, April, and May) was the planet’s second warmest on record. For the same period, only 2010 was warmer. Year to date, 2014 is currently ranked as the Earth’s fifth warmest year on record. Global temperature records date back to 1880. 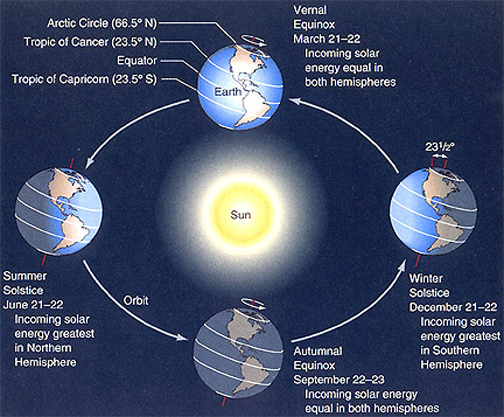 Today is the June Solstice, the first day of summer in the northern hemisphere. The new season officially began at 10:51 UTC, which is 6:51 A.M. Eastern Daylight Time. The astronomical seasons are produced by the tilt of the Earth’s axis – a 23.5° angle – and the movement of the planet around the sun. During the summer months, the northern half of the Earth is angled toward the sun. This position allows the northern hemisphere to receive the sun’s energy at a more direct angle and produces our warmest temperatures of the year. Since the winter solstice in December, the arc of the sun’s daily passage across the sky has been moving northward and daylight hours have been increasing. 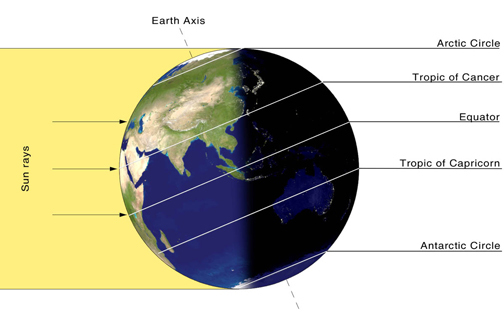 Today, it reached its northern most position at the Tropic of Cancer and marks the “longest day” of the year. This observable stop is where today’s event takes its name. Solstice is a word derived from Latin meaning, “sun stands still”. Now, the sun will start to move southward again in our sky and daylight hours will slowly start to decrease. 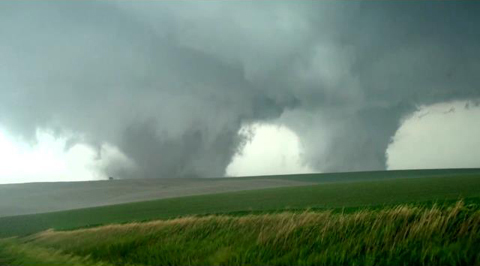 Barreling across northeastern Nebraska on Monday, a pair of twin tornadoes leveled the small farming town of Pilger, NE. The so-called “sisters” claimed the lives of two people and injured numerous others. The two wedge tornadoes were reported to have been on the ground for nearly an hour and traveled along parallel pathways getting as close as one mile apart. With winds ranging between 166 and 200 mph, the National Weather Service has rated both twisters EF-4. That is the second highest ranking on the Enhanced Fujita Scale. Massive twin tornadoes are rare events. Experts say, if one thunderstorm spawns two separate twisters simultaneously, one usually dissipates or is overtaken by the other. The size, strength, and longevity of Monday’s tornadoes were extremely unusual. With warm, moist air lingering over the region, violent weather returned to Nebraska on Tuesday. A multi-vortex tornado was spotted in Coleridge, NE, but that storm has not yet been rated. More severe weather, including possible tornadoes, is expected in the area again on Wednesday. Thunderstorms are fairly common in the late spring and summer in the United States. Every once in a while, though, they can be severe. When they are, the sky often turns green. You may wonder, what causes this odd coloration? According to scientists, the phenomenon of green skies is not completely understood. 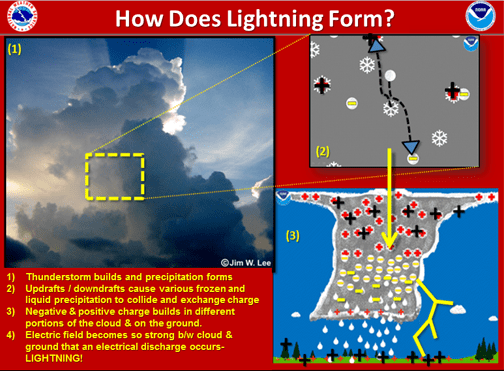 The leading theory, however, involves the dense moisture content of cumulonimbus clouds and the time of day. Most thunderstorms develop in the late afternoon, a time when the sun’s rays have to travel a long way through the atmosphere before reaching the ground. This causes the light we see around sunset to be reddish-yellow. Thunderstorm clouds contain large amounts of rain and hail. This water and ice scatters blue light. So, when these towering clouds form in the late afternoon, the two colors mix to give the sky a green or blue-green appearance. While severe thunderstorms can produce tornadoes, a green sky does not necessarily mean a twister is coming. Nonetheless, the color is associated with dangerous weather. 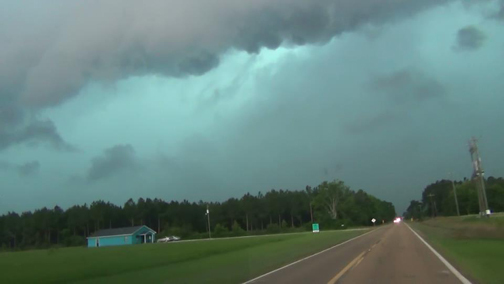 If you see a thunderstorm heading your direction and the sky appears green, you should seek shelter immediately. 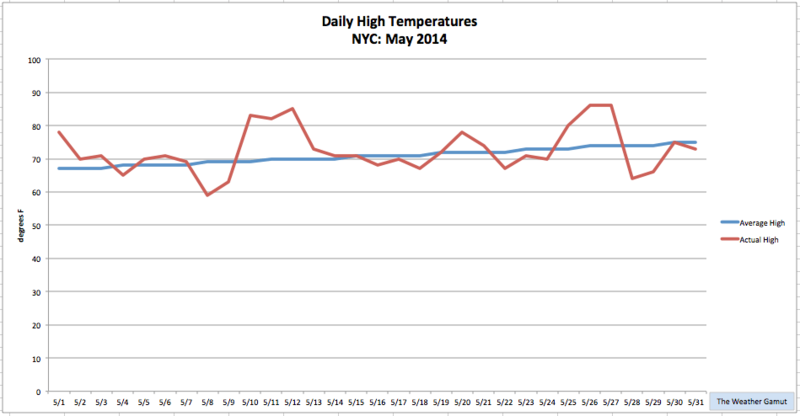 May 2014 was fairly warm in New York City. High readings in the 80s on six separate days helped push the city’s average temperature for the month up to 64°F, which is 2°F above normal. Following what felt like an endless winter, May was the first time all year that NYC had an above average monthly temperature. In terms of precipitation, the city received 4.37 inches of rain. Most of this fell during two significant rain events, 1.54 inches on May 16th and 0.91 inches on May 23rd. On average, the Big Apple normally gets 4.19 inches for the entire month. Today is the first day of the Atlantic Hurricane Season. While it is expected to be fairly mild this year, names have already been chosen for any storms that may develop. Since 1950, each Atlantic tropical storm or hurricane has had a unique name. They come from a set of six rotating lists produced by the World Meteorological Organization. A name is retired only when a storm was particularly noteworthy – causing a large number of fatalities or an extraordinary amount of damage. Sandy, for example, was retired after it devastated a large section of the northeastern United States in 2012. 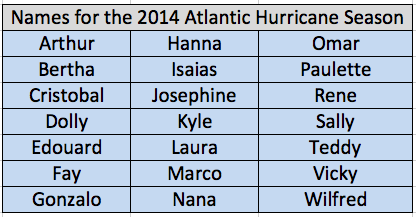 The names for this year’s storms are below.